Who is Dr. Kip Rode? “ A brief description; THOROUGH. I have never been to a Great Chiropractor before I met Dr. Kip Rode. I had been to only one chiropractor prior to him and all they did was a quick adjustment. Dr. Rode will explain the details and the structure of your back and will explain it to you in Layman’s terms (English) of how and why you are in pain. 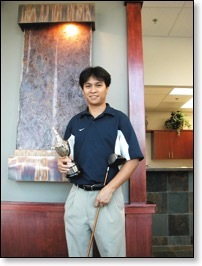 I am an avid Golfer and love playing golf whenever I can. I try to play my regular golf game with my buddies and for quite sometime now my main complaint after playing is my lower back. There have been numerous times that I had to lay down and sleep to take away the pain after playing golf. I am not a fan of pain medication and will sleep my way out of pain until or if I can. Then I met Dr. Kip Rode. He examined me and got some X-Ray’s going and found out the cause of all my aches and pains. He took care of me and made some adjustments to align my back. After a few days of visits, I saw a dramatic change, not only in my back aches, but in my golf game. I noticed that I can swing the golf club better and am no longer worried that I will hurt my back. I play in a golf tournament with a bunch of friends and play four different courses with different trophy for each course. In the past I had never won a trophy. Now since getting adjusted I won two of these course trophies winning the tournaments back to back. Not only did I beat my friends, but now I have bragging rights until next month’s game. Then I had a car accident: The very day of the accident, I visited Dr. Rode. He checked and made sure that there was nothing broken and all is in place. The next day, I was still in a lot of pain from the accident and had to visit him again and that really helped a lot! Thank you! Dr. Rode for giving me the opportunity to beat my friends in Golf and especially for resolving my back ache. I am all well now, but I still visit Dr. Rode when a golf tournament is coming up or when I am feeling the need for an adjustment!